Plan A is following the crowd. Plan A is doing the expected. When it comes to printing, Plan A is not your best choice. It pays to look a little closer and then choose Plan B from Brother. We make printers and all-in-ones that give you more. Lyra analyst Larry Jamieson mentioned the Brother campaign during his "Tuesday afternoon" presentation and he had a little different twist on the objectives of the company's marketing efforts. 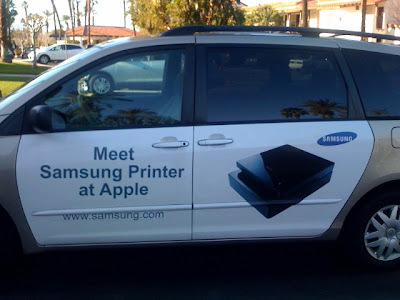 While we'd both agree that HP (NYSE HPQ) and its color laser printers and MFPs are the intended "Plan A" company and products, it was Jamieson's assertion that it's really SAMSUNG that Brother is going after in their communications, Samsung being the other viable #2 market share contender. Neither competitor has any realistic hopes, in the short term anyway, of coming close to market leader HP, but holding a strong #2 (or the "B" for "Brother) position is very important. In other words, their target audience is the more risk-taking, say, 20% to 30% of potential buyers, who might compare specs and be willing to go with another brand other than the market leader. Insightful thoughts, Larry! When formulating my late January travel plans several months ago, I discovered some good news -- once again this year, the Lyra Symposium and Demo 2008 conference would take place the same week, in the same vicinity. (Both near Palm Springs, CA.) But the nbad news -- unlike last year when the events only overlapped by a day, this year the agendas overlapped almost perfectly one on top of the other. This meant that with my commitment to Lyra as the official live blogger of the annual printing and imaging gathering, I'd be lucky to even get near Demo, despite the fact it was taking place no more than five miles from where I was. 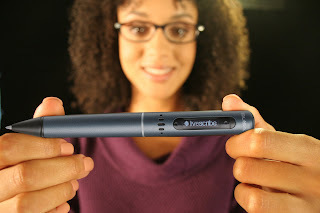 And check out the video of the Livescribe demo. End of the Symposium -- Software, Supplies, Digital Photography and Home Printing, and "Green"
The 2008 Lyra Imaging Symposium is history, but I’m still in Rancho Mirage compiling some final notes so I believe this still qualifies a “live”, but it will definitely be the last post under that mantle. Jay Vleeschhouwer, Managing Director, Merrill Lynch opened the mid-morning session following the Commercial and Production Printing module, with a presentation Adobe Sytems (NASDAQ ADBE) and other imaging-related software companies entitled “A Financial Analyst Perspective on Key Imaging Software Companies”. It was Jay’s turn to participate in a newer Symposium tradition, a Wall Street perspective on a particular company or market segment, that has been built on the popular and more wide-ranging Wall Street panels that close each day of the conference. Presentations and panels from industry participants and Lyra analysts moved us into the enormous and lucrative supplies segment of our business. The discussions followed a similar agenda to Lyras's August event, which seemed cram-packed as a day-long endeavor, so today's couple-of-hours-long agenda was really a lot to take in! The presentations included “Keynote: The Way Forward—Legal Perspectives on the Digital Imaging Consumables Industry”, from Edward O'Connor, Esq., Partner, Trial Division, The Eclipse Group; “Color and Cost Performance: Forecasting Toner Market Trends”, by Cortney Kasuba, Research Analyst, Lyra Research; “Beyond the Laser Bias: Inkjet Market Trends and Forecasts”, presented by Andy Lippman, also a Research Analyst with Lyra; “Changing Channels: The Supplies Distributor Perspective”, by Scott Zahl, Vice President of Vendor Management, Ingram Micro; and “The Hard Copy Supplies Journal Top Trends & Panel Discussion”, with Moderator Charles Brewer, Managing Editor, The Hard Copy Supplies Journal, Lyra Research; Rob Leonard, President, Leonard Consulting Group; Liz Leung, Director of Consumer Supplies, Epson America; and Brad Roderick, Executive Vice President, LaserCycle/InkCycle. As we entered into the final afternoon and the home stretch, first speaker under the banner of Consumer Imaging and Digital Photography with a great presentation titled “Recent Technology Challenges in Digital Photographic Print Quality”, Catherine Fiasconaro, Vice President, Operations and Director, SpencerLab Digital Color Laboratory, tracked her well-known company’s marketing research studies probing consumers digital photo printing perceptions and habits. One of her conclusions I found very compelling and consistent with my own patterns was a shift from preferring AgX (aka Silver Halide) prints, to accepting and believing that home inkjet print quality could actually exceed that of the traditional method, to still believing it but not wanting the bother of home printing of anything but a small number of prints. Then Steve Hoffenberg, Director, Consumer Imaging Research, Lyra Research, presented "Beyond Photo Output: Anticipating Opportunities in the Evolving Photo Culture", which offered two revenue and profit paths for the photo printing business – photo books that I’ve also covered in this blog in numerous posts, and the "Long Tail" approach to myriad specialty products that are custom-imprinted with customers’ digital images. Steve then moderated an interesting panel from industry participants in those two areas, including Tomasz Johannsen, Director, Product Management, EZ Prints; Graham McFarland, President and CEO, ExpressDigital; and Chad Richard, Chief Executive Officer, Simple Star. Larry Jamieson, Director, Hard Copy Industry Advisory Service for Lyra, presented his Home Printing recap, this year named “Consumer and SOHO Printing in an iPhone World”, and he was even gracious enough to use my iPhone printing anecdote (see "2007 in Review: iPhone Printing") in his opening, and offered a trend showing survey data revealing a down-turn in the home printer-to-PC ratio. The final module of the Symposium was “Green” oriented, with the keynote, “The Greening of the Printing Industry” by Michael Hoffmann, Senior Vice President, with the (NYSE HPQ) Imaging and Printing Group’s (IPG) Supplies organization. In stressing the importance of Green issues to HP’s customers, Hoffmann quoted a figure of 80% of Enterprise IT RFQs received in recent times include environmental considerations. He spoke to numerous initiatives especially around energy savings, both in terms of their products’ power consumption, as well as energy used by HP’s sprawling operations that surround the globe. HP is also touting decreased waste initiatives, with actions as basic as making duplex printing easier, but also promoting more efficient printing from the web (see “. Product recycling is big with HP and has been for decades, though with increasing emphasis – see today’s announcement about their conversion to manufacturing inkjet cartridges with recycled plastic. (See announcement.) Hoffmann closed with a compelling industry call to action, that will be posted here when I get the exact text. Lyra Founder Charles LeCompte offered his view of the importance of Green issues in ” Cradle to Grave: Lyra's Whole-View Environmental Impact Analysis of the Digital Imaging Industry” with a very interesting and bold presentation of the environmental “opportunity” facing our industry. Like his “Year 2000” presentation I wrote about (see "Observations: In the Year 2000...") earliler this month, LeCompte suggested some industry steps including following Hoffmann’s Call to Action or something like it. The day and the conference closed out with the “Wall Street Watch, Round 2” panel, moderated by LeCompte and including Shannon Cross, Principal, Cross Research, and Bill Fearnley, Jr., Managing Director, PC and Enterprise Hardware, FTN Midwest Securities Corporation, and Steve Reynolds, Lyra Analyst. Kodak (who had just announced earnings earlier in the day) HP, Dell, and others were fair game during this, again, wide-ranging discussion, and the remaining audience greatly appreciated the participation of Cross and Fearnley, who with all the earnings announcements, Fed moves, etc, of the last days were seriously and admittedly a bit sleep-deprived! Day Two's opening session covered commercial and production printing and included the following presos: “Re-Defining the Production Printing Solutions Value Proposition—Versatility, Reliability and Cost-Effectiveness” by Tom Wetjen, Vice President, Worldwide Graphic Communications Industry, Xerox Corporation; “Customizing the Customer Relationship: Online On-Demand Digital Printing Innovations”, presented by Scott Baker, Vice President Worldwide Business Development, GMC Software AG; “High-Speed, High-Volume: The Fast and the Furious in Production Printing” by Steve Reynolds, Senior Analyst, Lyra Research; and “The Future of Wide Format and Super Wide”, from Tom Baratz, Industry Consultant, Lyra Research. Take-aways? Along with leap year, the Summer Olympics, and the US Presidential election, this is a Drupa year, and the massive trade show in Dusseldorf Germany drives this segment of the business like nothing else. Well, except for maybe new trends (and/or buzz-words), like this year's favorite, TransPromotional. And that new Xerox (NYSE XRX) logo? I'm starting to get used to it! It used to be that I'd try to pick a popular song name for the title of each and every blog post I did, but that got way too hard. So now I just call 'em like I see 'em, to use a well-worn (and probably ill-fitting) cliché! As always, the information at Lyra comes fast and furious and it’s always at least a little tough to keep up, whether as an attentive attendee or guest live blogger. But here’s a brief summary of yes, Tuesday Afternoon. The next module turned more technical, first with Jim King of Adobe speaking on “The Future of PDF and Documents—The Next 15 Years”. Jim’s a fellow blogger, by the way, and his “Inside PDF” blog can be found at http://blogs.adobe.com/insidepdf/. A panel including King followed, looking ahead at PDF, XPS, and other file format and printer software matters, included Moderator: Martin Bailey, CTO, Global Graphics Software; Kevin Andresen, Director of Product Marketing, Print Language and Driver Software, Zoran Corporation; Craig Graw , Software Imaging; John Ingraham, Technical Consultant, QualityLogic; Jim King, PDF Platform Architect and Senior Principal Scientist, Adobe; Steve Martin, Vice President of Engineering, Monotype Imaging; and RanDair Porter, President and CEO, Pagemark Technology, Inc.
As the afternoon progressed, we had a “Global Spotlight” session that featured Lyra analysts Peter Mayhew and Jiqiang Rong, providing current updates on printer and supplies markets in Europe and China, respectively. The day finished with the always rousing Wall Street panel, moderated by Ann Priede and including Ananda Baruah, Vice President, Research Analyst, Banc of America Securities; Shannon Cross, Principal, Cross Research; Bill Fearnley, Jr., Managing Director, PC and Enterprise Hardware, FTN Midwest Securities Corporation; Rich Gardner, Managing Director, Citi Investment Research; and Jay Vleeschhouwer, Managing Director, Merrill Lynch. This part of the symposium is always worth hanging in for (maybe that’s why the organizers make it the last agenda item of the day!) and is difficult to summarize, to say the least. One takeaway though is that this group is not at all convinced economic doldrums are close at hand. With indicators like this year’s record Symposium attendance along with a high level of enthusiasm for the business would seem to go along with that. This is not an official "live from Lyra" post, but in the interest of being timely, HP (NYSE HPQ) has officially announced a printer-related "green" initiative (as of 12:01 am EST on January 30, 2008) that's brilliant in its simplicity, though no doubt anything but simple in its implementation. USA Today's Michelle Kessler has a piece I'll refer to for now, but I will be blogging live tomorrow (Wednesday 1/30) with details as provided by HP's Michael Hoffmann as part of his Lyra Symposium presentation on HP's use of recycled plastics in its inkjet cartridges. You might be at a printer conference when...you see this vehicle in the parking lot! The lunch break has arrived on the first of two days of the 2008 Lyra Symposium, and along with it the nice weather, on a calm and pleasant day in the California desert. The major portion of the morning was dedicated to Printing in the Enterprise. Ann Priede, the managing editor of Lyra Research's The Hard Copy Observer (and, in the full disclosure department, my boss when it comes to my monthly print column duties for that publication) provided a recap of the year 2007 in the printing and imaging business. She used a creative MySpace-inspired approach dubbed LyraSpace that provided a dashboard for industry participants, in looking back on what was an eventful year in the business. Bruce Dahlgren, Senior Vice President of HP's Global Enterprise Business, Imaging and Printing Group (IPG), followed with an interesting presentation, talking about "Alternate Thinking to Printing" where he explained what HP means when talking about "Print 2.0 in the Enterprise". He traced some of the history of enterprise printing, going back to his days as a more generalized IT executive, and frankly shared his general disinterest in printing back then, at least as anything strategic. He then traced changes in enterprises, with some great anecdotal material, evoking memories of mail carts and overhead transparencies among others, and described the change that has been wrought during the shift in eras from print-and-distribute to distribute-and-print. Not surprisingly, he concluded with a vision that involves MFPs as information on-ramps and off-ramps, implemented with processors, connectivity, and user interfaces that make them capable and thus relevant to end users as well as IT organizations and the entire enterprise. All using HP devices and Managed Print Services, of course! Steve Reynolds, Senior Analyst, Lyra Research, followed with a talk entitled "Future Growth Factors in Enterprise Printing: Workgroup Printers and MFPs, Color Penetration, Laser vs. Inkjet, and Edgeline vs. Memjet" that tracked each of the major copier/MFP vendors and their approach to the business, including Managed Print Services. While he covered many competitors, my thoughts were around his comments about HP, which was a mixed review, to be fair. As a relatively new entrant in the copier/MFP realm, the company has had success as well as failure or at least frustration. When it came to this bullet point about Managed Print Services, though, I thought back to some of my conclusions from Dahlgren's talk. While the cynic might observe that the HP "Print 2.0 for the Enterprise" story is really just a another version of HP's Managed Print Services by another name, albeit fortified with Dahlgren's leadership, a growing selling effort, and strategic acquistions (see "Exstream Printing"), to name a few, isn't that what Reynolds is saying it will take for HP to succeed? The parts, at least many of them, are there, now it just takes strong and steady efforts, and if it's called "Print 2.0 for the Enterprise" now, so be it! The Enterprise Printing Track closed with presentations from Cortney Kasuba, Research Analyst, Lyra Research, with "Enterprise Printers and Copiers Tell All: Insider Insights from Lyra's Office Print Monitor", and Laura Hunt, Director, Marketing and Strategic Partnerships, PrintFleet, who spoke on "Managing Profitable Relationships with Managed Print Services". The companies are partners in the OPM project, which is rapidly developing interesting trend data on end user printing behavior in organizations. The Symposium Keynote -- Bill McGlynn, a long-time HP printer executive who is now CEO of Memjet Home and Office began his speech recalling his experience with the original HP LaserJet printer and the revelation of the Canon SX laser engine that led to it – an “exothermic epiphany”, in his words, that happened in the early 1980’s. It was a very rare event. More typical in our industry and others in high tech is the steady, marching incremental improvement. But that sensory feeling that he equated to the “Smell of Grandma’s Baked bread…” does indeed happen every once in a great while. And for McGlynn, “once in a lifetime” happened twice. After leaving HP several years ago, he was invited on a trip to Sydney Australia where saw the startling Silverbrook printing demo. He did what any of us would do – looked for tricks or gimmicks. But in reviewing fundamental details of Silverbrook’s technology, which he shared for the Lyra audience, he was convinced they were on to something breakthrough. Since signing on with the company he's also been excited to participate in breakthroughs outside the tech arena, in areas like business models and pricing. How did it happen in Australia, of all places? R&D facilities had sprouted in Australia due to a governmental trade-off that allowed corporations breaks on import duties in exchange for establishing research branches. When the Internet bubble burst at the end of last decade, freed-up world-class engineers and scientists became that Silverbrook Research was able to employ in their development. And it's also been the company's very patient angel investors over the last seven to eight years that have supported the Silverbrook development. A 13-year pre-revenue program could rarely if ever happen in a large company, with all the corporate ups and downs that would have inevitably led to the chopping block for a program like this. Also when it comes to timing, the time for color is here, McGlynn asserts. Imagine a few tears ago -- color flat panels in the produce section of a grocery store? Color displays on mobile phones? Silverbrook technology delivers market-flipping potential for color over monochrome in everyday printing. Another “exothermic epiphany” may be here. A color printer that goes at 60ppm, with a $300 street price? This combination just doesn't fit the organizational model within many existing printer companies – per McGlynn, a good indicator of true disruption. He goes on that these new economics of color printing open the door to non-incumbents, just as HP was a non-incumbent in desktop printing 25 years ago. The 2008 Lyra Imaging Symposium has officially kicked off with Monday's opening evening reception. Presentations over the next two days promise to include numerous insights into the direction of our industry, and I will be posting some of the most interesting ones right here. Coming up this first morning? We'll be hearing from executives from Memjet, HP (NYSE HPQ), Xerox (NYSE XRX), and PrintFleet, along with a bevy of Lyra Research analysts. And we'll see if Lexmark's good news puts the conference in a buoyant mood! In this morning's pre-market-open earnings announcement, Lexmark International (NYSE LXK) reported fourth quarter earnings well ahead of last year (10%) and even further ahead of most expectations. Revenues for the quarter were actually down a bit from last year ($1.31 Billion vs $1.37 Billion), it was "growth in higher usage segments" that helped Lexmark surprise on the upside for a change. Sorry it's been nearly a week since my last post, but forgiving readers will remember I had some dedicated avocational time starting mid-last-week through today. I attended the final few days of the Sundance Film Festival, purely as a fan of independent film and NOT as a printing and imaging industry observer! However, to give a little tie-in to this blog, and before providing a few of my film-going highlights, I will offer my personal thanks to HP (NYSE HPQ) (see "HP Sponsors Sundance Film Festival, again"), and also Adobe Systems (NASDAQ ADBE), both major Sundance Film Festival sponsors. I was fortunate to view some of the best films I've ever seen in my personal tenth-anniversary annual trek to the festival (headquartered in Park City, UT), and I'm highlighting the best here "for your consideration" -- in other words, my advice is to definitely see these films when they come to your neighborhood movie theater (or home set-top box)! The documentary film directing award went to another festival favorite, Nanette Burstein's "American Teen," which follows four Indiana high school students through their senior year. "Sleep Dealer," a cyberpunk drama set in the near-future, won both the Waldo Salt Screenwriting Award and the Alfred P. Sloan Prize for outstanding film focusing on science or technology. Don't miss these four films when you get the chance to see them! And now on to Live Blogging the Lyra Imaging Symposium 2008! But this one's dead-on in the Enterprise Printing arena, specifically Variable Data Printing space, and HP's well-prepared information web site tells an interesting story that is worth reviewing. Statements like "this strategic acquisition will represent a cornerstone investment for IPG’s [HP's Imaging and Printing Group] Enterprise segment and positions HP as a leader in the enterprise document automation space" strongly express HP's commitment and strategic direction. As far as the timing on the news, what can you do? Reminds me of my time working on the HP/Indigo acquisition team, and being excited and ready to go with press release and official announcement just after Labor Day, 2001. The announcement did come, for the deal that was arguably the first major step in this same broad Variable Data Printing space that today's deal extends, but the timing? Tech historians will remember that the HP/Compaq acquisition story broke that same early September weekend in 2001, followed a few days later by tumultuous world events that put today's perceived woes in a little perspective. Last year, almost to the day, I covered the official formation of the printing industry joint venture (by IBM and Ricoh) of InfoPrint (see "Welcome, InfoPrint Solutions"), and today they are announcing a customer relationship with Personix as the "First U.S. Service Bureau to Select InfoPrint 5000 Production Color System for Statement Printing". That's straight from the headline of the release! Kudos for the great example of how to be direct and explicit, InfoPrint! I had a chance to talk to InfoPrint VP George Promis about the transpromotional solutions they and their competitors are marketing, and I really like what he had to say about the InfoPrint approach, due to its end-user focus and my own bias towards understanding and meeting customer needs. While it's easy to think of transpromotional printing as placement of personalized advertising on customer billing statements, Promis has a more appealing definition, that of "including any and all information relevant to the recipient [i.e. customer]". That may or may not include appropriate personalized advertising, but can also include a wide variety of information that's been intelligently selected and printed due to its relevance to the individual receiving the statement. Great customer focused thinking! It must be mid-January because the Sundance Film Festival has opened, and HP (NYSE HPQ) is back as a major sponsor. Angela LoSasso has an pre-opening blog post worth checking out, with an interesting tie-in to the expanding Small Business/In-house Marketing programs the company has been touting over the last few years. Among the numerous services and products highlighted, I found the link to the HP Retail Photo Services page quite interesting. Clearly a new service (with NO Idaho destinations, alas, and only three in neighboring Oregon), it will be interesting to see how HP blends this "order online/then pick up" service, based on HP hardware and supplies and supporting what looks to be Longs Drugs and some independent retailers, and its Snapfish services that send photo print jobs to (originally) Walgreens and now including Staples and other (and also Longs), some of whom feature "politically incorrect" printers and supplies. And with the January 2008 stock market debacle ongoing, when has there been a better time to sit in the dark and escape with a few films? I'll be at the Festival again this year, as I've been regularly attending for over ten years now, but strictly in an avocational capacity, as an independent film fan. HP's entry into the ranks of major Sundance sponsor was welcomed by me, at least, when it came about five years ago, and remains in my mind one of the positive legacies of the Carly Fiorina years. The printing industry can claim at least a tiny piece of the PR pie from this week's MacWorld Expo. The Apple (NASDAQ AAPL) Time Capsule access point/backup storage appliance announced by Steve Jobs during his Tuesday keynote also includes the ability to connect to USB printers, thus serving as a wireless print server for the Macintosh clients that share the Time Capsule. See "Apple Time Capsule for Wireless Time Machine Backups". The title of this month's column is a play on the recurring Conan O'Brien bit that began in the show's early days and playfully looked ahead to the Year 2000 with outlandish projections. Rather than retire the skit when the year 2000 came, the bit continued on with the same title and an unapologetic look "back" at the future. Now I am looking back at a famous printer industry prediction made in the Year 2000 to see how we are doing eight years later. At the 2000 Symposium, Lyra President Charles LeCompte took the stage and put together his case for the coming demise of printing and paper. At the time, the assembled crowd took the presentation with the proverbial "grain of salt," as I can attest as an audience member, and during the intervening years, LeCompte's presentation has become legendary in its alarmism. In fact, at every Symposium since, LeCompte's infamous 2000 pitch is the subject of at least one or more wisecracks, with the good-spirited LeCompte the source as often as not. The apparent assumption underlying the chuckles is that the presentation, titled "From Paper to Pixels: The Word Becomes Electronic," somehow missed the mark altogether. But after taking a more careful look back, I assert that the identified underlying trends were mostly right on, and it could be just the timing that was off. Of course, by 2000, the idea of electronic documents was hardly new. In the presentation's introduction, LeCompte referenced documents, such as business forms and internal documents like company directories, that companies had already migrated from hard copy to electronic form. But the factors were aligning for a much larger diaspora, including newspapers, magazines, and books, or so went the presentation's rationale. When looking at external factors that influence big shifts in business, I favor using the characteristics of "STEEP"—Social, Technological, Economic, Environmental, and Political—partly because it is an easy-to-remember acronym. And that is largely what this presentation did to build its case. Under "Social" changes, burgeoning trends in freedom and flexibility for office workers seemed to favor "information on the fly" over heavy and cumbersome paper documents. Under "Technological," the trends included PCs, with laptops coming to dominate over desktops; the growth in personal digital assistants or PDAs; and price/performance improvements in LCD (as opposed to CRT) displays. These and other technology advances played into the assumption that tablet PCs would become pervasive and comprise the preferred medium for consuming information, largely replacing paper. The "Economic" card came in with shifts in the advertising business, working hand-in-hand with the transition of the traditional information industry's output (newspapers, books, and magazines, specifically), from print to dissemination on the Web. Advertising's changing needs were seen as largely funding the continuing development of an online information infrastructure that supported viewing over printing. The "Environmental" and "Political" factors foreseen included a strong "green" movement that would crack down on printer and paper industry suppliers and customers. So how did it all sort out at least at this intermediate point between the final two predictive checkpoints, 2005 and 2010? My opinion is that LeCompte nailed individual components quite well, with some twists, of course. For example, the "tablet PC" has come into being, and while it is not a huge market success, per se, the combined categories of laptops and portable devices continue to gain every year in their relative and absolute popularity. Devices like Blackberry handhelds and the iPhone were not really anticipated but can be seen as logical extensions and convergences of mobile phones and PDAs. The LCD screen is not quite the perfect reading medium and, in fact, the deployment of the "E-Ink" screen in the Amazon Kindle e-book at the end of 2007 provides evidence of a continuing quest for a better paper substitute. All in all, I'll give LeCompte an "A–" on his Technology foresight. Under the "green" banner (though no one was calling it that back then), we have seen huge movements in our industry toward the areas of environmental awareness and action. While the efforts span a variety of initiatives, notably lower power consumption and waste reduction through eco-friendly packaging and supplies recycling programs, a big part of the green effort includes the reduction of paper output through simple means such as promoting duplex printing and more sophisticated document-management solutions that integrate electronic documents with printed output as part of an enterprise's information infrastructure. Give our industry high marks for reading the "writing on the wall" and staying ahead of direct political sanctions on this one, and give LeCompte a solid "A" for knowing and saying that environmental concerns were looming. With the decline in "printed information" industries since 2000, LeCompte was certainly on the money here. How the advertising industry has adapted to fewer print-focused eyeballs is a complex answer, but it is safe to say they have done it largely by using "new media," including the emergence of search-based advertising, led by the growth of Google, into a $200 billion-plus market cap tech giant. On the "social" side, you cannot overlook the change that ties to lifestyles, and more importantly, the relentless march of time and the turning of generations. Eight years later, the first baby boomers are nearing the last stages of their working careers, and those entering the workplace now were "tweeners" in 2000. One could argue that trends like social networking, text messaging, YouTube, and video gaming, work against hard copy, at least in one way or another. I am going to give LeCompte an "I" for incomplete on this one as the changes he anticipated in 2000 are really only just beginning. So as far as the "causes," the presentation fares quite well in retrospect. But how about the outcome that paper consumption would peak in 2000, then dip to half that level by 2004, and to only 20 percent of the 2000 level by 2010? This is a much, much more complex equation than most of us are accustomed to analyzing. Moreover, even the simplest scenarios demonstrate that "timing is everything" in forecasting, much as in comedy. While paper and printing use continue to grow in low-single-digit annual percentages, the seeds are being sown for big change. Perhaps like dot matrix printers and film cameras in the recent past, threats loom but the band plays on, at least for a while anyway. Ironically, my research for this column may provide some comfort for those of us in the printing and paper industries. My inspiration for this column originally came from my memories of the 2000 Symposium, and as it germinated into a full-blown column idea, I needed to review LeCompte's actual presentation slides. I was unable to put my hands on my own copy of the original presentation, so I asked my friends at Lyra, the publisher of this newsletter. The firm complied but not with the electronic version I had pictured, because it had been lost to the ages and one too many hard-disk crashes. The paper version remained however, so the firm faxed it over! Note: The Lyra Imaging Symposium for 2008 is coming up soon. I'll be live blogging from the event so check back here for all the fun and excitement! In a news release issued today, as well from their booth at the Macworld trade show, Ricoh Americas has announced a new line of laser printers that offer "access to reliable laser printing from Internet-enabled laptops, cell phones or handheld devices without the need to download and install drivers or additional software". The company has partnered with PrinterOn to provide the solution. While the release uses Blackberry printing as its example, the company's presence at Macworld clearly shows their interest in iPhone users' printing requirements, and I applaud the effort to meet this (until now?) unmet user need! Maybe it's because the presidential political season has finally really started, with Iowa caucausing last week and New Hampshire holding the nation's first primaries on Tuesday, but I can't get the political term "coattails" out of my head, thinking how it applies to this year's CES and the new crop of printers and related gadgets. The political definition of the term refers to the effect of a popular candidate for higher office sweeping along others of the same or similar persuasion on voting day. And the comparison this year is with the Zink/Polaroid partnership "heading the ticket", so to speak, and others, notably the $299 PRINTSTIK portable printerfrom PlanOn, helping bolster the printer portion of the CES buzz as well as they themselves benefitting from an overall piqued interest in the category. 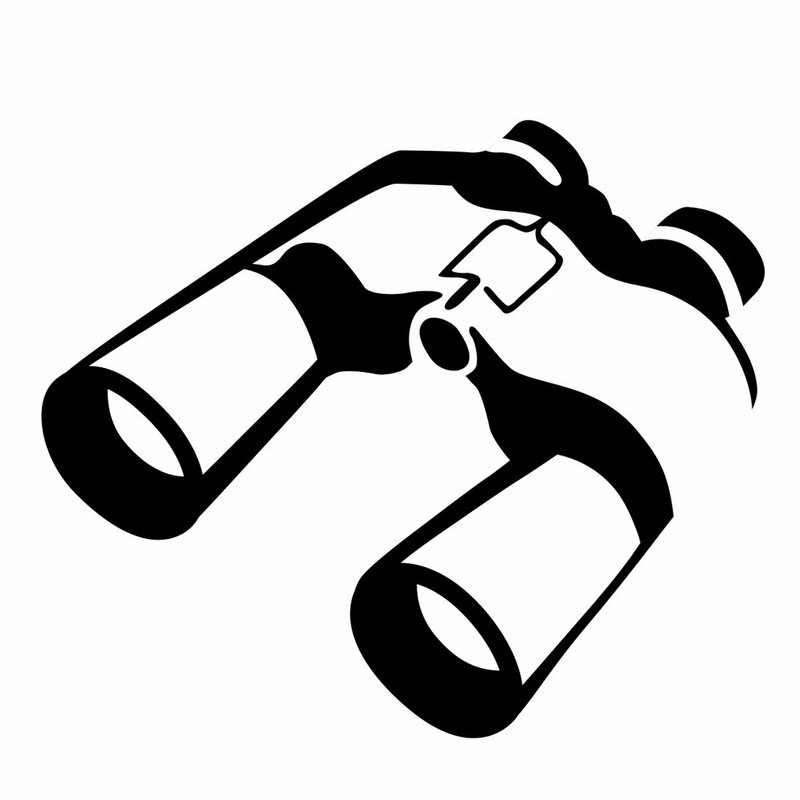 A great blog post from Al Sacco at the CIO Advice Blog exemplifies the effect. My colleague Ed Crowley and The Photizo Group have some worthwhile observations of their own from Day One and Day Two of CES. 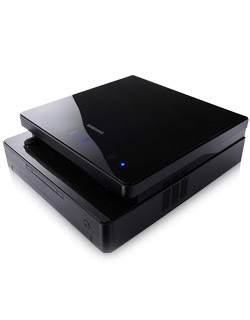 Day One's notes point to Photizo's interest in three smaller companies, InPlay, Ality, and Pictometry, with Day Two's update featuring more of the large company action, including notes on the Samsung laser MFP and printer (SCX-4500 MFP and ML-1630, pictured above). While not exactly brand new, these models continue to turn heads with their stylish designs, if not their cutting edge speeds-and-feeds specifications. It must be a sign of a new stage in the industry, when products with looks and style as their main selling points create a stir and some backlash as well. Zink, the company with the "inkless" printers that I began following starting with their Demo2007 appearance nearly a year ago, made a splash at CES this week, announcing their partnership with Polaroid, among others. The Polaroid connection (actually an ongoing one that goes back to the roots of the Zink technology) resulted in a rarity of sorts for the printer industry -- news coverage in the general and business press. For example, AP has a story that was picked up by CNN (see "Polaroid Back To Its Roots With Tiny Printer".) The company also announced partnerships with Alps, Foxconn, and TOMY. Price war in online photo printing? I got the promotional email from HP (NYSE HPQ) on December 28th, announcing their new nine-cents-a-print price for online (Snapfish) 4x6 photo prints, but frankly didn't pay much attention. Maybe I should have. Anyway, the move to 9¢ by HP and its Snapfish subsidiary has reverberated into the financial markets and online photo printing pure play Shutterfly (NASDAQ SFLY), whose stock tumbled 16% yesterday. Read "Why is Shutterfly Shuddering? ", the blog post by Eric Savitz at Seeking Alpha. A news release this morning, "Adobe, HP, Memjet, Xerox Leaders Tackle Enterprise Printing at 2008 Lyra Imaging Symposium", reminds industry members that a new year is truly upon us. And just like last year, I'll be the event's official live blogger during the symposium later this month, January 28-30 to be exact, reporting in from its traditional conference venue in Rancho Mirage, CA. So see this blog at the end of the month for updates from what promises to be another stimulating and informative gathering of industry analysts, leading executives and Wall Street's best. Business Week magazine is out today with its "2007 Businessperson of the Year" award, honoring HP (NYSE HPQ) CEO Mark Hurd (see "HP's Laser-focused Leader"). Much of the overall HP story of course goes well beyond printers and printing, but Imaging and Printing leader Vyomesh Joshi is quoted several times in the brief article by BW's Louise Lee, touching on HP's move of the monochrome LaserJet business to China, the threat in the consumer photo printing space from other printer companies like Kodak (NYSE EK) as well as from non-printing substitutes like photo frames and online sharing, and HP's move up-market into more and more commercial printing markets. Two questions/clarifications from me -- first, Kodak entered the market in 2007 not 2006 (in this iteration anyway), and, second, those "liters of ink" used by commercial printers seem unlikely to bring comparable margins as compared to those home and office inkjet supplies. It's January 2nd 2008 and time to get back into the routine, but I'll indulge myself with one last backward/forward view, with references to several web resources worth reviewing. Another link worth following is Michael Arrington's third annual "Web 2.0 Companies I Couldn't Live Without" at TechCrunch. The list for 2008 is his largest yet, containing almost 20 companies. A quick (or careful) read is a great way to help characterize the state of the Web 2.0 industry, enhancing the more generalized definitions. For printer industry types, we're certainly going to continue to hear a lot from HP (NYSE HPQ) on its "Print 2.0" initiatives in 2008, so if nothing else, having a good perspective on the namesake is well worth the effort. And now just for fun, take a look back at the news from 2007, via the guys at JibJab. Highly recommended!